You have to hand it to Neck Deep as they have achieved so much in the 5 years they have been together as a band and easily go down as one of the most successful pop-punk bands to hail from the UK and that’s pretty massive considering the band are so early into their musical career, the band signed to Hopeless Records back in 2013 and soon released their debut album ‘Wishful Thinking’ which was then followed up a year later with their ‘Life’s Not Out To Get You’ album and have now just released their much hyped third studio album ‘The Peace And The Panic’. Since forming back in 2012 Neck Deep have been on one hell of an amazing journey with signing to Hopeless Records so early into their music career, completing two full on stints on the America based Vans Warped Tour, embarking on various sold out headline tours across the UK and Europe, playing all the major alternative festivals across the UK and Europe and most importantly releasing three absolutely solid studio albums with their latest ‘The Peace And The Panic’ being one of the finest albums released so far this year. Despite musically being one of the hottest pop punk arounds, since releasing their second studio album ‘Lifes Not Out To Get Us’ things haven’t been entirely rosy for the members of Neck Deep with guitarist Lloyd Roberts stepping down from the band due to various false allegations being thrown his way, both frontman Ben Barlow and bass player Fil Thrope-Evans dad’s passed away whilst they were out on tour as well as the loss of a few close friends and whilst listening to ‘The Peace And The Panic’ you can tell that these truly awful life changes have helped the band sound more mature musically and lyrically. The album opens up in style with the pop-tastic ‘Motion Sickness’ the song features all the hooks, bounce and catchy moments that you have come to expect from Neck Deep over the years, vocally Ben Barlow is at the top of his game especially as he sings out “Don’t’ stop now, though the motion sickness has you spinning out ‘cause you’re on your way, oh my friend just look how far you’ve come and think twice before you go and throw it all away” during the songs infectious chorus. ‘Happy Judgment Day’ just like ‘Motion Sickness’ opens with some massive riffs and vocally is big fast and catchy and lyrics such as “Oh what a time to be alive wake up and smell the dynamite” and “Is it just me or does anyone else feel like this could be farewell? Oh, we almost had it then we pissed it all away” and Never thought I’d see the day when the world went up in flames” as Ben Barlow sings out the struggles of life and the current state of the world. Songs like ‘The Grand Delusion’, ‘Parachute’ and ‘In Bloom’ go down the mid-tempo route a route which is featured quite heavily throughout the album and Neck Deep show off their more mature sound and feel and out of the three mentioned tracks ‘In Bloom’ easily shines the most as Neck Deep go down a dreamy route in a more toned down alt rock way. Being a band a who don’t who like to try different things the guest appearance from architects vocalist Sam Carter is much welcomed during ‘Don’t Wait’ a pop-punk song which turns hard-core once Sam Carter’s vocals come in and he screams his lungs out. ‘Critical Mistake’ and ‘Heavy Lies’ are proper bouncy summer anthem, ’19 Seventy Sumthin” see’s Ben Barlow sing about when he was younger and ‘Wish You Were Here’ see’s Neck Deep proper slow things down and get serious as they sing about the loss of a lifelong friend a song which so many people can relate to and a song which is as beautiful sounding as it is emotional sounding. The album comes to a close with ‘Where Do We Go When We Go’ a song which closes the album perfectly with huge riffs and equally as huge sing-a-long moments. 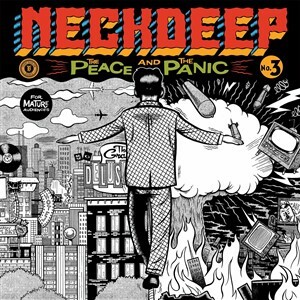 ‘The Peace And The Panic’ is easily the most diverse and most creative album Neck Deep have created so far as one minute you will be listening to a pop-punk anthem about having fun in the summer, the next you will be listening to an emotional song about losing a loved one and dealing with depression and then they next a mid-tempo political song as Neck Deep have really upped their game this time and wrote some of the strongest songs of their career so far and it is safe to say the album is easily going to feature in many publications best of lists at the end of 2017.